Looking for a gentle dentist in Peoria, AZ? When you walk into our office, you will be greeted by a friendly team of professionals who will take a sincere interest in you and you will be treated like family. My staff and I are committed to understanding and meeting your needs as a patient. Why do patients choose Ideal Dentistry? Gentle dentistry – At Ideal Dentistry, we take great pride and satisfaction in providing gentle, painless dental care for our patients. Patient comfort is our first concern. Our patients often comment on how painless their dental treatment was. Professionalism and experience – Ideal Dentistry is a friendly, experienced, and professional dental office. 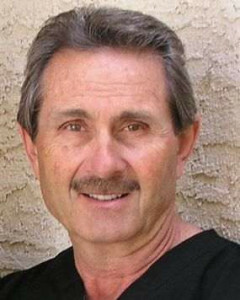 “I have been practicing dentistry in Peoria and Sun City, AZ for over 30 years. Each member of my highly trained dental team has at least 25 years of professional dental experience. Familiarity – One of the many reasons why our patients like our dental practice is because they like seeing familiar faces each time that they visit our office. My assistant, Kelly, and I have worked together for over 30 years. Tracy at the front desk has worked at Ideal Dentistry for over 6 years. Quality – At Ideal Dentistry, our goal is to provide each patient with the highest quality dental care possible and we only use the highest quality dental labs and clinical supplies in our practice. “Dr. Olson is without a doubt the best dentist that I’ve ever been to. His professional staff makes your visit pleasurable.”- Mike L.
“I would highly recommend Dr. Olson to anyone in need of veneers. I am so happy with the work he did for me.” –Carly H.
“Great, professional care. I highly recommend Dr. Olson.” – Sharlene T.
At Ideal Dentistry, our patients come first. We’re committed to offering each patient personalized, quality dental care in a friendly and caring atmosphere.